Workmanship Warranty – Inland offers a one year material and workmanship warranty on all metal building systems. This warranty includes all components of the metal building system designed and fabricated by Inland Building Systems against failure due to material or workmanship for one year from the shipment date. 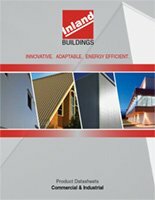 Inland Building Systems offers: Twenty Year Acrylic-Coated Galvalume Finish Warranty / 25 Year Siliconized Modified Polyester (SMP) Paint Warranty / 30 Year Kynar 500 Finish Warranty / Three classifications of the Twenty Year Weathertightness Warranty. Please contact Inland Building Systems’ sales department for specific information. TS324 / VS216 Standing Seam Roof Weathertightness Warranties: Inland Building Systems offers four types of weathertightness warranties associated only with our TS324 and VS216 standing seam roof systems. The first type of warranty is the Limited Weathertightness Warranty and the second type of warranty is the Premium Weathertightness Warranty. The Premium Weathertightness Warranty has three levels of coverage including up to a “no dollar limit warranty,” giving Inland Building Systems four types of weathertightness warranties.